I’d be lying if I said that I haven’t taken some delight in watching the complete and utter collapse of Blockbuster. You see, back when I was a child, our community had a couple of thriving local video stores that were the source of pretty much endless enjoyment for me. Then Blockbuster came along. By then, the company was already a mega-chain of blue and gold awnings that decorated much of the country. They had inventory that simply could not be matched. Unsurprisingly, they crushed the local video stores. This happened all over the country for years. Goliath didn’t just beat David, he obliterated him simply by showing up — and then danced on his grave while entertaining his children. You’d think the sheer momentum of such a behemoth would make them unbeatable. And yet, here we are. Earlier today came word that Dish Network was buying Blockbuster’s assets out of bankruptcy court for around $230 million — in cash. This is the same company that Viacom once paid $8.4 billion for (and later spun them off in their own multi-billion dollar IPO). The fall from grace is almost unbelievable. 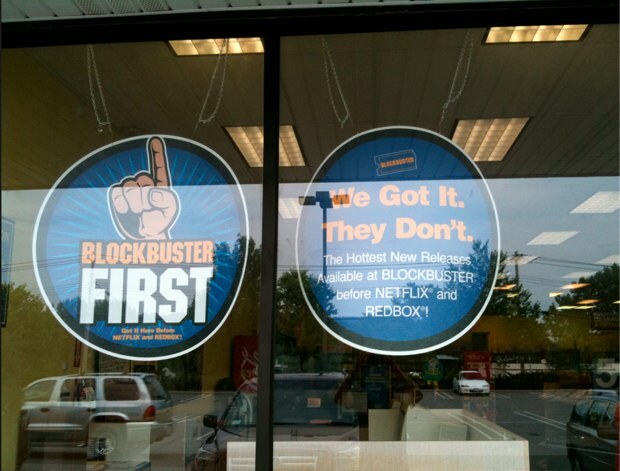 But it’s actually not if you’ve been following Blockbuster over the past several years. And their tale could end up being a great cautionary one for today’s current crop of giants. And more importantly, it might serve as a point of inspiration for startups going up against a seemingly unbeatable giant. Microsoft, Google, Apple, etc. All of these guys may seem unbeatable. If they’re investing resources into a space, you might as well not even try, right? But that’s exactly what Reed Hastings did in 1998 when he started Netflix . He was simply a disgruntled Blockbuster customers who was sick of the ridiculous late fees and thought he could do better with a new approach to movie rentals. Blockbuster undoubtedly laughed at Netflix at the time. In fact, two years later, Blockbuster could have bought Netflix for just $50 million — quite literally pocket change for a company that had held a $5 billion IPO the year prior. Blockbuster refused all such offers, as Fast Company’s excellent rundown of the best Blockbuster gaffes reminds us. Instead, Blockbuster put a huge investment into Enron (their broadband services subsidiary). You can’t make this stuff up. It wasn’t until 2004 — six years after Netflix launched — that Blockbuster realized it needed to enter the online DVD rental-by-mail space. By then, Netflix was already turning a profit and Redbox had just launched. 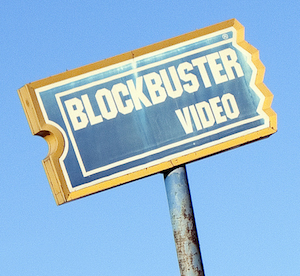 Blockbuster was already dead — they just didn’t realize it yet. It’s such a great example of a company resting on its laurels and getting blindsided. But it’s hardly even fair to call it a “blindsiding”. Blockbuster probably could have done dozens of things to counter the rise of Netflix in that initial six year space. They were either simply too arrogant, too slow, too stupid, or all of the above to make a move. That’s why it’s impressive that Google is making such big changes to the company right now, when they’re arguably at the peak of their power. Their not resting on their laurels. Hundreds of challengers are gunning for them in a number of areas, and the co-founders apparently saw the company slipping a bit — as did some of the rest of us — and decided to proactively make some bold moves, all of which we haven’t likely seen yet. This was a guy, Jim Keyes, who had just attempted to take over Circuit City, thinking that would solve Blockbuster’s problems — more retail stores. A few months later, Circuit City went belly up. The fact that Blockbuster didn’t end up buying them probably saved them from the same fate for the remaining two years of life. Later, Blockbuster’s head of digital strategy had another money quote in a sit-down with Fast Company. “We’re strategically better positioned than almost anybody out there. Never in my wildest dreams would I have aimed this high,” he said indicating that they could still beat Netflix. The famed former Iraqi Information Minister couldn’t say this stuff with a straight face. So if you’re out there working on a startup in a space owned by a giant, just remember that nothing lasts forever. Even the biggest companies eventually grow complacent and get taken down. There are angles and new ideas all over the place that they simply cannot (or will not) see around their egos and wads of cash. They will snooze and they will lose. Every night used to be a great night to make it a Blockbuster night.